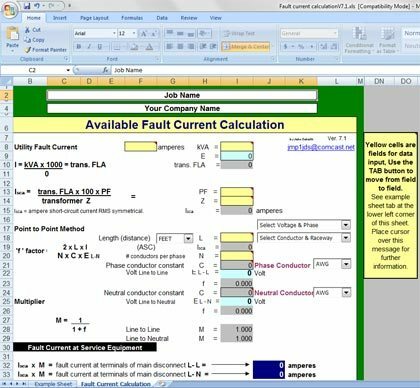 This MS Excel Spreadsheet is created by mr. John Sokolik and it represents an easy way to calculate fault current by entering few values in indicated fields. You will find sheet with very nice example already fulfilled. Before starting fault current calculation, you will have to choose between Step 1a and Step 1b which are explained below. Insert available fault current ampere rating from your local Utility. Insert the the kVA rating power factor (PF) and impedance (Z) of the transformer is not required to continue. Note: When you insert the kVA rating power factor and impedance you must select the voltage from the dropdown box Select Voltage & Phase before the value will be calculated. The tools are most valuable materials that will empowered young and existing engineers to grow in their field of operations. I really really enjoy your articles keep it up please. Very nice and worth for learning!! Comprehensive short circuit analysis factors in both active and reactive parts of equipment impedance and contributions from multiple sources including motors and generators. 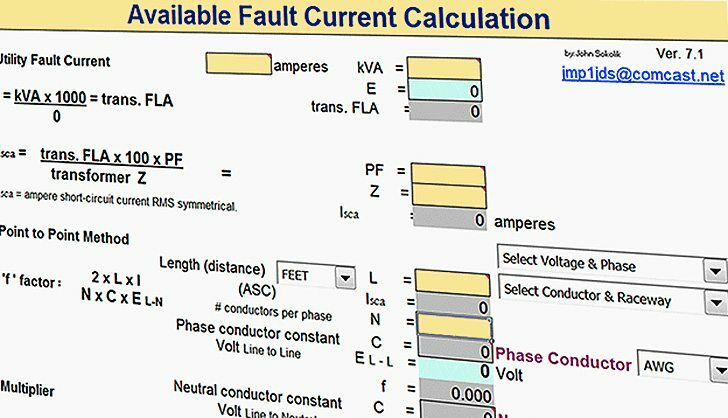 Consider free Short Circuit Analytic software program at http://arcadvisor.com/short-circuit-software for your short circuit fault current calculations needs. Thank you very much, Interesting topics… Nevertheless, could you provide me a background for the medium voltage transformer ground fault system protection. In particular, design application and calculation of a right NGR for a Power Transformer, 12/14MVA, 13.8/4.16KV, delta-Y, 3ph, 60Hz. Can you provide information with examples on how to calculate fault levels the long hand method. Thanks. this is a very good website! I work with Electricity Authority of Cyprus and i am the section head of High voltage cables. I really enjoy reading your articles. They are very good and very helpful. I am using your spread sheets for various calculations. we use mm2 conductors as apposed to AWG so it would be nice to select either. Thank you for the great work you have done. Yet could you make an option which allows you to input the cable data in mmsq and not in AWG (European Standards)? Thank you very much. It is great to have such kind of facility to able to speed up your calculations. Such kind of excel sheets are definitely useful to crosscheck the calculations. But , can you pls update this with LV Earthing system (IT,TT,TN etc..) & Transformer windg method (Y,DYN,yn etccc). with out these the pgm is good enogh only for 3 phase fault which is not allways the design criteria of LV system.